TPA activist Bruce Lawson has emailed over a letter he found in his local paper (click to enlarge). A concerned taxpayer has gone through his council’s job site to see what exactly is on offer. What a good idea that is to expose the true cost of local government! 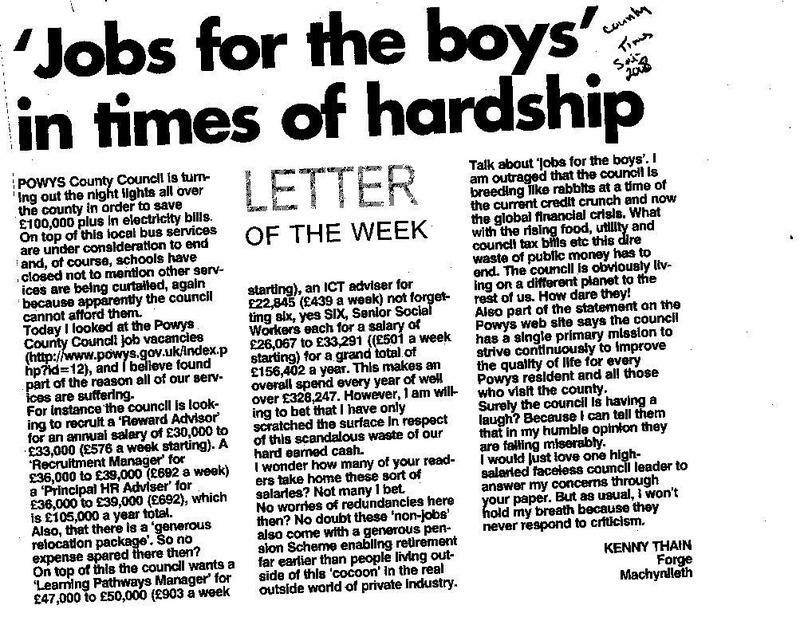 Kenny Thain looked through is council’s job vacancies and found the council were advertising for £382,247 worth of jobs in one day. Bruce informed me that the Powys Council had just ‘saved’ £225,000 by turning the street lights off, which made for quite a contrast of council priorities. That begs the question; do you know what positions your council is looking to fill this week? You never know, you could spot the next ‘Street Football Coordinator’ at your council. If you should do, email me so we can name and shame the council and hold the big spenders to account!